The weather in Washington has been awfully dry this winter which means it hasn’t snowed much in our Cascade mountains. This is quite disappointing for the skiers here! Our ski season started with two days in Breckenridge over Thanksgiving, and thankfully yesterday marked the end of our dry streak. Usually our ski season starts in mid-November with decent coverage. Our first ski day is always about getting back in a rhythm and working out the kinks, and yesterday was no different. Pumped to get back to the snow! 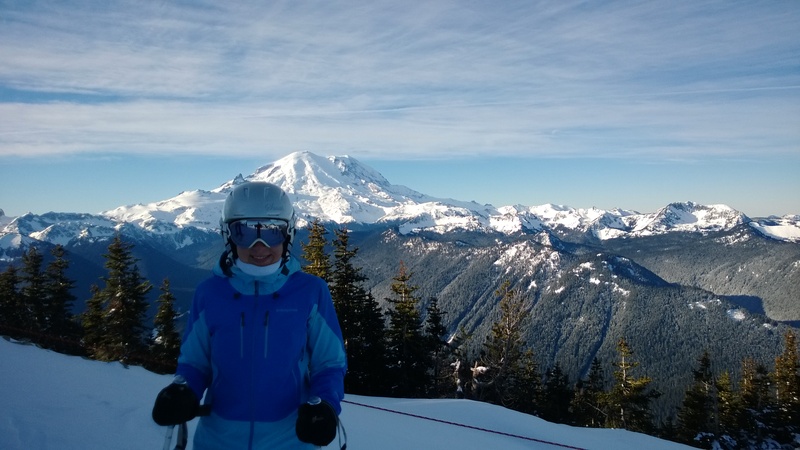 We packed up our ski gear and loaded up the car the night before so that on Saturday morning all we had to do was roll out of bed, get dressed, put the skis on the car and get our food ready to go. We’ve got a pretty good system down for food on ski days. Both of us really enjoy having a hot breakfast and a hot lunch when we’re spending the day on the mountain. Alex whipped up some breakfast burritos for us to wrap in foil and take in the car with us to have on the way to Crystal while I heated up some carrot ginger soup that I had made previously. We have a big thermos that works really well for soup or chili that we use most ski weekends, in addition to a smaller thermos that we bring coffee in. It works out really well for us to bring our own food – it’s healthier and much less expensive. 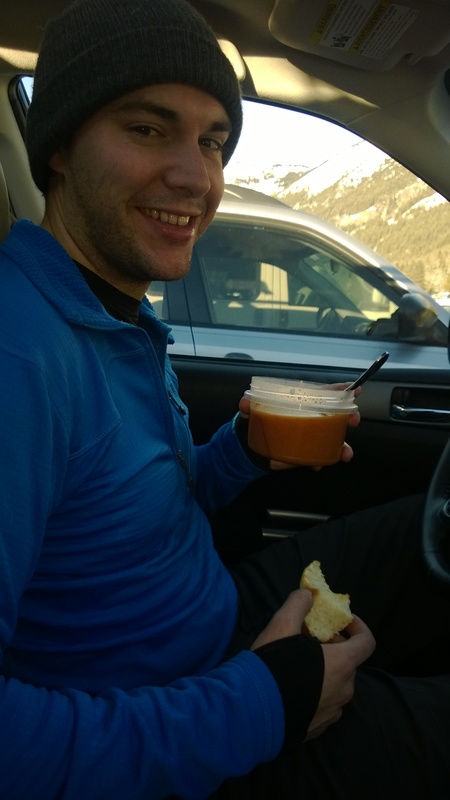 Eating soup and a roll in the car after skiing. Yesterday we left our house just before 7:00, which put us at the base of Crystal at 8:45. We left about 15 minutes later than we had hoped to, so we’ll have to be a little speedier next time. 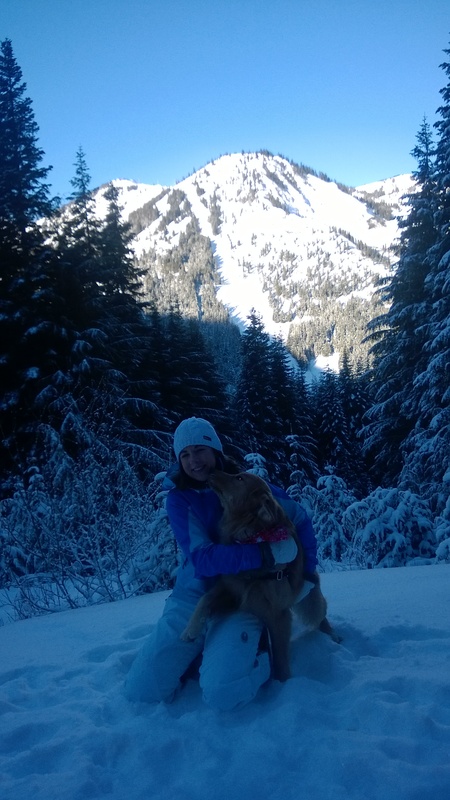 Jackson came along with us so before we went skiing we took him on a little mountain adventure of his own. 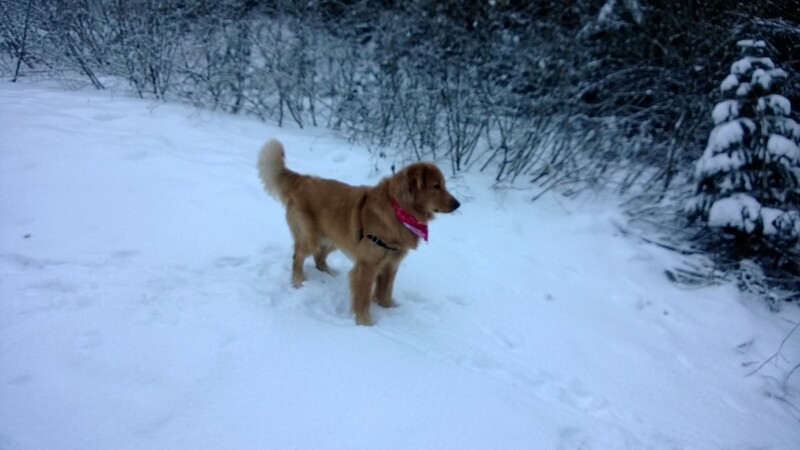 There is a groomed path through the woods that we let him run off leash on. Usually there’s a lot more snow, but since it’s been so dry there was just enough snow for Jackson to run around in. By the end of our walk Jackson was good and tired. 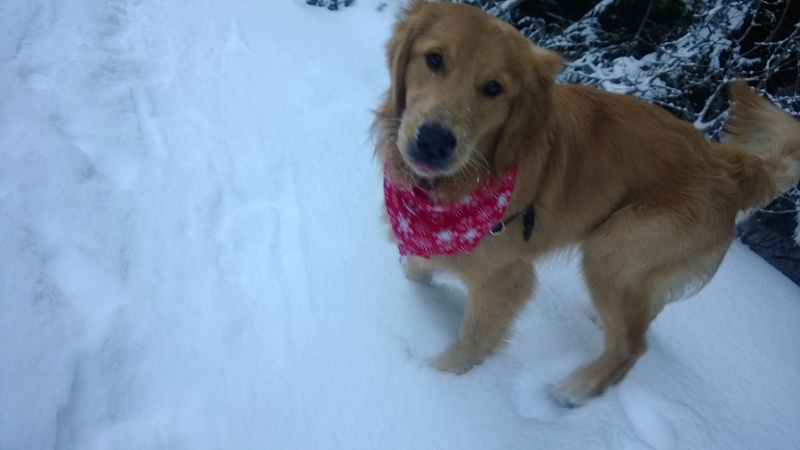 We left him in the car for a bit while we skied a few runs. He has toys and a comfy spot to lay in the back of our SUV, plus his fur coat keeps him nice and warm. 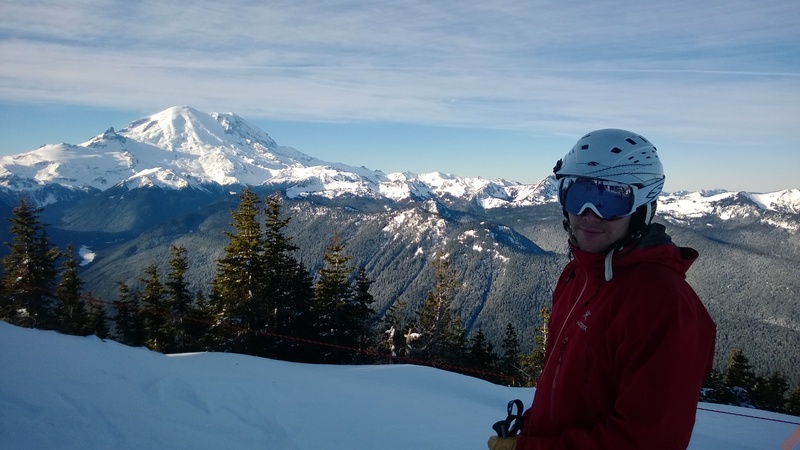 On our first ride up the chairlift we were greeted by Mount Rainier! 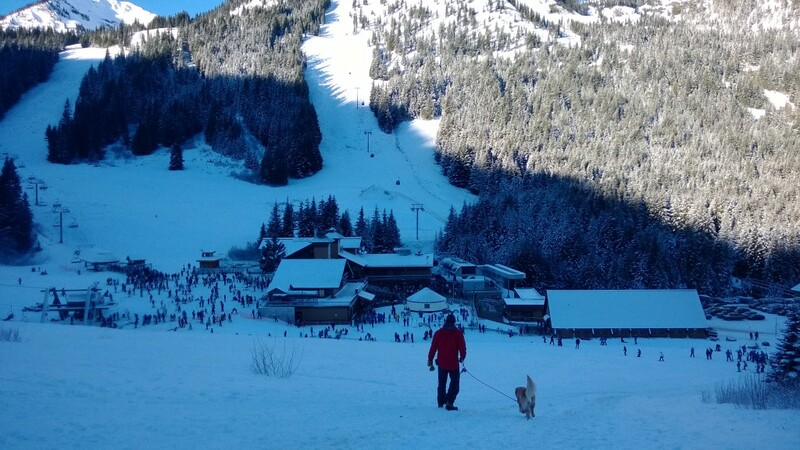 It was such a beautiful day to kick off the start of 2014 and our ski season in Washington. 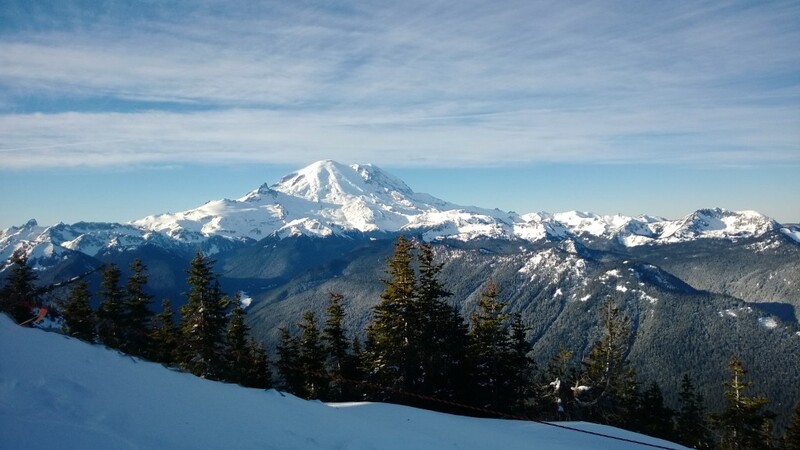 The views from Crystal Mountain on a clear day are unbeatable. We didn’t ski a ton yesterday, mostly because the conditions yesterday were less than desirable. The snow pack was probably lower than I had ever seen it and it was incredibly icy across the mountain. We did get a few awesome runs up in Powder Bowl, so that made it more worth our while. 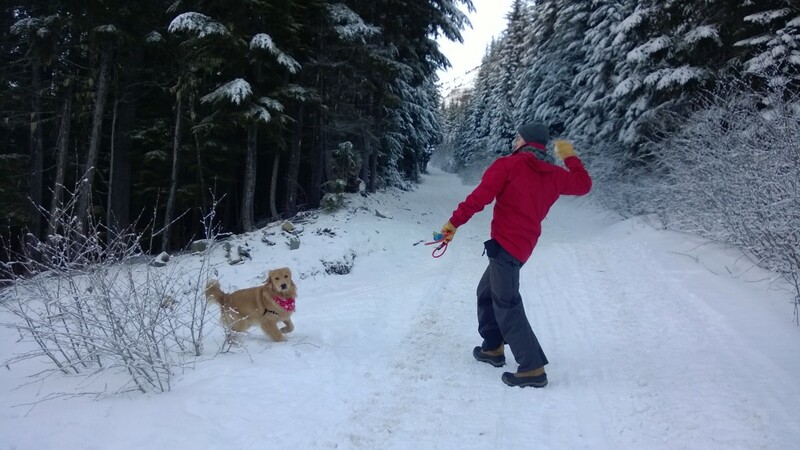 We ended our day by doing some avalanche beacon practice drills. There is a spot near one of the lodges where they have transceivers buried in the snow for you to practice finding with your beacon and probe. I got an avalanche beacon for Christmas from my dad, so it was a great opportunity to get out and practice using it. I sure hope I am never in a position to have to use it for real, but it’s nice to know how it works! Jackson, Alex and I had a great first day at Crystal this year and we all hope it’s the start of many more to come. 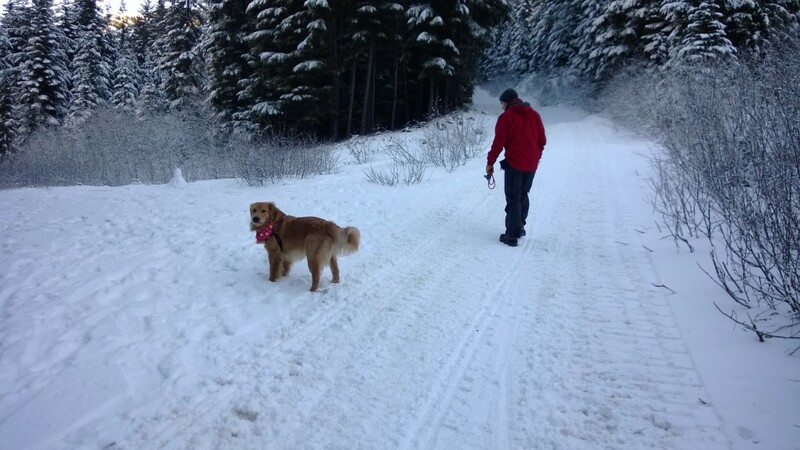 This entry was posted in Fun, Life, Pets, Skiing and tagged Jackson, mountains, skiing, weekend on January 5, 2014 by Alison Allen.